Four days of fierce fighting left 32 people dead and many injured when heavily armed Turkish police and military units stormed 20 jails across the country in late December. The police action was launched to quell a two-month-old hunger strike by more than 1,000 political prisoners, most of whom were incarcerated simply for belonging to organizations that criticized Turkey's military-dominated government. Using tanks and bulldozers to break into areas where the hunger-strikers were holed up, Turkish security forces encountered furious resistance from inmates. Several prisoners reportedly doused themselves with flammable liquid and lit themselves on fire as Uzi-toting police entered their cells. Many victims of the raids were members of the Revolutionary People's Liberation Party-Front, a radical leftist group. Turkish Prime Minister Bulent Ecevit said the violent crackdown, code-named "Return to Life," was necessary to help "save terrorists from their own terror." Atrocities are widespread in the Turkish prison system. their intention to dismantle the large, dormitory-like wards and transfer inmates to separate, small "F-type" cells. Fearing this would make them more vulnerable to torture and beatings by jail wardens, the prisoners started a hunger strike, which they vowed to continue until the Turkish government relented. The prisoners' fears of torture and police brutality are certainly justified, according to international human rights groups, which have documented widespread atrocities in Turkey's corruption-ridden penal system. "Torture is a state policy and continues to be used systematically," says Turkish human rights attorney Eren Keskin. "All thinking apart from official thinking is a crime." If one can measure the value of human life in a society by looking at its prisons, then Turkey is an abomination. The Human Rights Foundation of Turkey estimates that around 1 million people have been tortured in Turkey since the military coup in 1980. At least nine Turkish prisoners are known to have been tortured to death in 1999. Last year the Turkish government made almost no progress in terms of key human rights reforms. "While the government procrastinated, politicians and writers were prosecuted and imprisoned for expressing their nonviolent opinions, and detainees in police custody remained at risk of ill-treatment, torture or death," Human Rights Watch reported. The European Union is concerned about the omnipotent role of the army in Turkish society, including three coups since 1960. Unless the military's influence is checked and the human rights situation improves dramatically, Turkey's application for E.U. membership will founder. Specifically, the European Union has called for the abolition of the death penalty in Turkey, an end to widespread torture, the lifting of constitutional curbs on free expression, and the granting of full cultural rights to the country's Kurdish minority--including the right to educate and broadcast in their own language. But Kurdish activists are still being arrested and tortured on a regular basis. Turkey is preparing to put on trial 13 Kurdish children, who face a minimum of three years in prison for shouting slogans sympathetic to the banned Kurdistan Workers' Party. The youngest, Yasar Kaya, is nine years old. All the children come from the Kurdish village of Derik, which was forcibly evacuated and burned to the ground by Turkish security forces in 1990. Since the 1991 Persian Gulf War, Turkish troops repeatedly have crossed into northern Iraq to battle Kurdish rebels. Despite its monstrous humans rights record, Turkey continues to enjoy strong support from Washington. Currently the fourth-largest recipient of U.S. foreign aid, Turkey stands at a strategic crossroads between Europe and Asia, Christianity and Islam. Bordering Iraq, Syria, and ex-Soviet republics, it maintains the second largest army in NATO, and it also exerts considerable influence in heavily Turkic regions of oil-rich Central Asia. During the '90s, the Clinton administration approved $5 billion worth of weapons sales and giveaways to Turkey. (About 80 percent of the Turkish arsenal is U.S.-made.) Without staunch U.S. backing, the Turkish government would not have been able to wage a brutal counterinsurgency campaign against its Kurdish population in southeastern Turkey that killed 35,000 people and razed 3,000 villages, while maintaining a police state in the rest of the county. Although the State Department has acknowledged serious abuses, U.S. officials offered little criticism when Sema Piskinsut, leader of the Turkish Parliament's human rights commission, was forced to relinquish her post in November. During her three-year tenure as chairwoman, the commission had won praise for its daring exposures of human rights violations. Piskinsut conducted several surprise midnight visits to Turkish police stations and prisons, where she found blatant evidence of torture--specially built soundproof cells with exposed electric cables, clubs, lashes and metal bars used to beat suspects, a suspension device known as "the Palestinian hanger," and other instruments of corporal punishment. Enraged at her for proving that torture was commonplace in Turkey, police and interior ministry officials insisted that she be fired. Piskinsut was abruptly relieved of her duties, and the job of overseeing the parliamentary human rights commission was given to Huseyin Akgul, a member of the far-right National Action Party (NAP), an organization with a violent neofascist pedigree. Highly praised by Turkey's generals, who have the final say in government policy, the NAP jettisoned some of its more extreme rhetoric when it joined the national governing coalition in 1998. Prior to this point, the NAP was best known for its record of street thuggery and bloodshed. The NAP's late founder and longtime leader, Alpaslan Turkes, had espoused a virulent ethnic nationalist ideology summed up by the slogan "the Turkish race above all others." The NAP is the parent organization of the Gray Wolves, a neo-Nazi terrorist group that has stalked Turkey since the '60s. A 1996 parliamentary report confirmed that members of the Gray Wolves had participated in the government-sponsored "dirty war" against ethnic Kurds and Turkish dissidents. In cahoots with U.S.-trained and -equipped security forces, ultra-right-wing death squads were responsible for many of Turkey's 14,000 unsolved murders and disappearances that occurred in the past decade. During the recent hunger strike, police stood by as Gray Wolf militants attacked a building where a prisoners' relatives association met to plan solidarity actions with the fasting inmates. In subsequent street clashes, extreme right-wing youth flashed their wolf sign as they assaulted a protest march by hunger-strike sympathizers. NAP officials, including Akgul, defended the recent prison raids that sought to crush the prison fast. 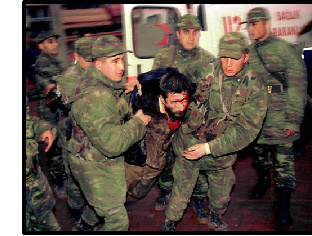 There was "no excessive use of force" against starving prisoners and "no violations of human rights," Akgul declared shortly after the crackdown. Human rights organizations tell a different story. A joint statement by Amnesty International and Human Rights Watch said that prisoners were systematically abused and tortured during the prison raids and afterward while being transferred to the new cells. Many of these inmates were awaiting trial and had not been convicted of a crime. There were numerous reports of prisoners who had been denied treatment for bullet wounds and other injuries. Huseyin Diri said his brother, incarcerated in the northwest Turkish city of Izmut, was beaten every morning for refusing to sing the national anthem. Diri told CNN that his brother's face was covered with bruises and that he had to be carried into a visiting room. Other prisoners say they were raped with truncheons. Human rights organizations have been warned that criticism of the F-type prison cells could itself be a criminal offense. Meanwhile, hundreds of Turkish and Kurdish inmates are still on a hunger strike. Drinking only small amounts of water, many are close to death. Solidarity fasts have spread to jails in France, Germany, Greece, Spain and the Netherlands. The Turkish government recently announced plans to free half of Turkey's 72,000 prisoners. But the general amnesty does not apply to prisoners of conscience, such as 19-year-old Sevgi Ince, a five-foot-tall woman who walks on crutches. Crippled from torture, she has spent the past four years in a Turkish prison without being told what crime she allegedly committed. It may have something to do with Ince's efforts to locate her disappeared sister. If she ever gets out of prison, Ince says she would like to work in a rehabilitation center for torture victims. But such facilities are illegal in Turkey. Martin A. Lee is the author of Acid Dreams and The Beast Reawakens, a book on neofascism.